Super Savings Item! Save 36% on the Mr.Go Auto Emergency Traction Aid, Portable Car Vehicle Tyre Grip Recovery Tracks Traction Mat Pad Sand Ladder -Free From Off-road Mud, Snow, Ice, and Sand - 2 Pack - Black by Mr.Go Outdoors & Sports at Social Seeker. MPN: //. Hurry! Limited time offer. Offer valid only while supplies last. As the weather worsens and the snow piles up, driving becomes more and more dangerous. The roads become increasingly slippery due to snow and ice. As the weather worsens and the snow piles up, driving becomes more and more dangerous. The roads become increasingly slippery due to snow and ice. Drivers need to use proper caution and be prepared for the treacherous conditions. The Portable Vehicle Recovery Track, made of high strength engineering rubber and galvanized steel core, it is nearly indestructible and can be used over and over again. It works in mud, snow, ice, and sand. It can be used with many types of automobiles, from front wheel drive to rear wheel drive to all wheel drive. The Portable Vehicle Recovery Track is easy to use. Simply wedge The Portable Recovery Track under the pulling wheel (or wheels) and slowly drive the vehicle to a more suitable surface. Then store it in your trunk or behind the seat for future use. The Portable Recovery Track traction aid will allow you to get back on the road again with very little time or money lost. With the average price of a tow truck call nearing a hundred bucks, just one use of The Portable Tow Truck will more than pay for itself. If you use it once, you'll never travel without it. 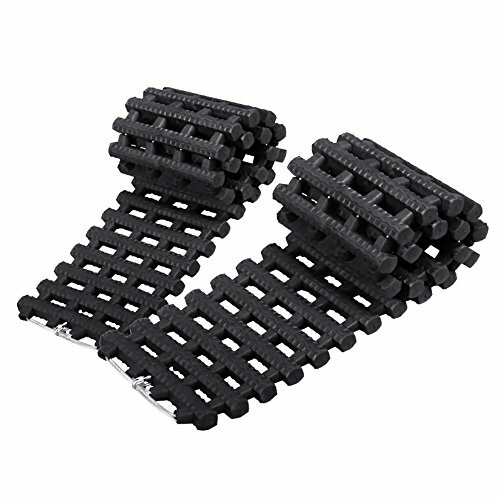 Each set comes with 2 Portable traction aid. Lightweight and easy to store and clean. If you have any questions about this product by Mr.Go Outdoors & Sports, contact us by completing and submitting the form below. If you are looking for a specif part number, please include it with your message.